2 of 4 Slice Italian bread lengthwise, then cut crosswise into 4 sections, each about 4 inches long. 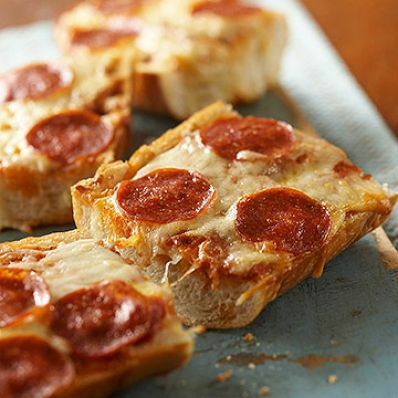 3 of 4 Spread each piece of bread with pizza sauce, dividing equally. Then top with 1/4 cup cheese and 3 slices of pepperoni. 4 of 4 Bake at 400 degrees F for about 12 minutes or until cheese is melted and lightly browned. Serve immediately. Per Serving: 487 mg sodium, 1 g fiber, 35 mg chol., 6 g sat. fat, 16 g carb., 11 g Fat, total, 214 kcal cal., 11 g pro.